Hi Everyone!! I'm sure I'm not the only one who has said this at the high street store/designer store/flea market/boot sale/charity or thrift shop!! The last 2 were part of a 3 items for £1-the other item was a tan leather belt. Anyway, back to the bags. I seem to make beelines to bags-I can't help it! At least I do try and give some away that either other family members can have or ones I don't like go to the charity shop. I'm sure all responses will be varied, hopefully!! UPDATED TO ADD: SORRY TO THE PEOPLE WHO ALREADY VOTED, I WANTED TO EDIT MY POLL , BUT DELETED IT BY MISTAKE-I'VE DONE A NEW ONE, BUT WITH MORE CHOICES-HOPE YOU CAN VOTE OR RE-VOTE-THANKS!! UPDATED TO ADD AGAIN-THE POLL FINISHED WITH THE WINNING GROUP OF 11-25 BAGS!! THANKS EVERYONE FOR VOTING!! You have to take me shopping. 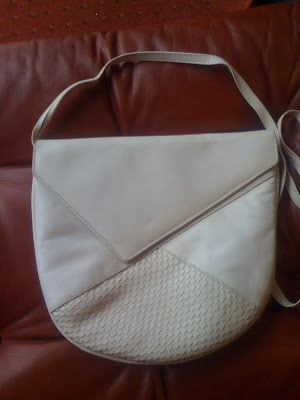 The first one is realy beautifull, I'm looking for one as beautifull as this bag! Hm, I think I am falling within your "bag" range:)) The problem with me, though, is that I tend to wear my favorite ones too often while all of the rest stay at home. Hi Wendy-I think we would have an absolute ball........plus an empty purse at the end!! Hi ness in the mood of mode!! Thanks for stopping by my blog!! Thanks for your kind comment, yes I'm pleased with it-it is very roomy, too!! Hi Ida-yes, I also tend to wear 'favourite' ones, too-I need to rotate them all more often really! Tell me about it-LOL!! I would LOVE a vintage Chanel-I did have one, but I resold it a couple of years ago on EBay as it was a biggish tote and I really would prefer a littler one! Lets hope we get one!! oohhh. love the bottom one the most! Hi Bear-thanks for stopping by my blog!! Yes, this is my current 'favourite'! Oh Ida-Even I'm beginning to regret selling it now!! Siljes-you crack me up! 200? I obviously should have put an extra 0 on my poll figures-LOL!! So, I take it you are in the 21 or more category, then!! It's nice to see someone who is crazy about all things fashion-I salute you, Siljes!! 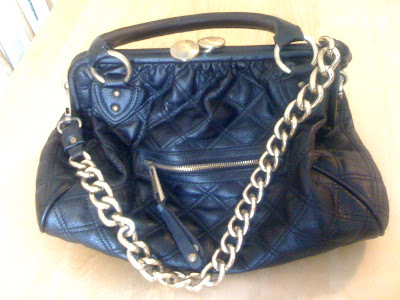 Using your beautiful Chanel bag regularly, you won't be able to rotate your others that much!! ooo that third bag is pretty sweet! Woooow, I love this stam bag! @ pounds?!?! I'm soo jealous. Thanks Karla-this is my favourite too-thanks for stopping by my blog!! Hi ash1314-yes I've grown to love it too-it's a bag with a classic style-I think it will be around a long time! Hi styledigger! Thanks for stopping by my blog-yes a good bargain, I'm pleased!! Oh my God! Where do you live? I'll want to be your neighbor and a shopping buddy!!!!! i have 11 handbags, so i wouldn't think 19 is THAT much. i always knew i had many handbags, but i didn't think i had as many as 11. well, your handbag purchases are entirely justified, i love them all. but the blue one is the most beautiful one, in my opinion, and the white one is great too! i'll vote in the poll right after i've posted this comment! The bags are amazing and the price of them is even better! It must be so great, living where vintage is so cheap! In Munich you have to pay 5-20 Euro for a vintage bag. :) I like the bottom one, great find! The blue one is my fav. Can't say no to a handbag. I have more than I need. Don't have a clue how many, but I do use a lot of them for storage around my room. Even bathroom. Hi everyone-my internet has been down ALL day so sorry I haven't replied sooner! Hi Tanya! Thanks for stopping by my blog! I'm in Essex in England, and will happily be a shopping buddy!! Hi pammish-thanks for stopping by my blog-yes, a steal for £2!! Hi cate-thanks for stopping by my blog! Thanks so much-actually the'blue' one is black, my picture is poor quality-ha ha! It's my new favourite, though!! Hi emma!Thanks for stopping by my blog! Yes, I reluctantly do agree on this one-ha ha!! Hi apolloniafashion-thanks for dropping by my blog!! it's nice and roomy! Hi Charlotte-yes, the boot sales have been really good so far this year-there are a lot of sellers selling quality things cheap-IF you are prepared to rummage and look!! Hi pamcasso-yes, this is my favourite one too! 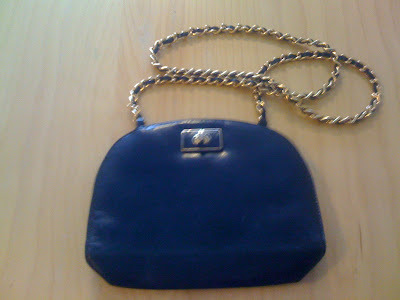 Hi fashionable obssessions-ha ha, so much for my great photo skills-the bag is black! It is my current favourite, too!! Hi ellie-I'm pleased I'm not the only one-I always seem to rummage around the bags for a bargain! Hi emma-you are on my list too!! The first bag is soooo great! Thanks so much Nadine-its lovely and roomy!! Hi fashion chalet-thanks so much!I'm a sucker for them!